Salted peanuts, raisins, almonds, cashews, and M&Ms are in this trail mix, a copycat of the prepared trail mixes you’ll find at the store. Bonus: Making it at home costs less, especially when you find some of these ingredients on sale. This is a favorite of ours for lunch boxes, after-school snacks, and snacks at work. Adjust the amounts here to your liking, but this mixture was the closest I came to store-bought. Just mix it all in a bowl. This recipe is originally from Mourad Mazouz, the owner of the London restaurant Momo. It’s a wonderful, easy, and elegant way to serve oranges as part of a meal. Bonus: It can be plated up and made ahead. We had a “breakfast for dinner” night and this was on the table with homemade pancakes and breakfast sausage. Everyone finished their plate, including my children, who devoured it. My son even enjoyed the garnish of fresh mint! I have changed the recipe a little from the original, which I got at some point while we were in London. His calls for regular oranges that are seedless, which I couldn’t find at this time of year, so I used mandarins. His recipe said to slice the peeled oranges, which is difficult with mandarins, so I broke them up into sections and cut the sections into small pieces. That was more accessible for my children anyway. Separate mandarins into sections, then cut each section into four pieces and divide them evenly onto plates. Sprinkle with sugar (depending on your preference, you may not want to use it all), then orange juice, then cinnamon. Put a sprig of mint on each plate. Serve chilled. There isn’t much to say about this recipe, but it’s a basic one that ought to be in your cookbook somewhere. I’ve been making more of these lately so we can dye them for Easter eggs. 1. Wash eggs to be hard-cooked in warm soap and water. 2. Place eggs in a single layer in an enamel, glass, or steel pan. 3. Add enough tap water to come at least 1 inch above the eggs. 4. Cover the pan and rapidly bring the water to a boil. Then turn off the heat. If you’re using an electric range, take the pan off the burner. 5. Leave the cover on the pan. Let large eggs sit for 15-17 minutes; medium eggs about 3 minutes less; extra-large about 3 minutes more. 6. Heat retained in the water will continue to cook them, so remove eggs with a slotted spoon and transfer to a bowl of ice water. Cooling helps prevent the green rings that sometimes form around the yolks. Don’t worry if the eggs crack a little during boiling, because they are still cooked and perfectly edible. If you dye them, part of the egg underneath the shell will be colored, but since most egg dyes are food-safe it won’t matter. To eat them, tap the eggs gently on a hard surface to make cracks, then gently peel off the shell. Slice or cut them into chunks, sprinkled with a little salt. Chop them for an egg salad sandwich or crumble them for a salad. Or make them into deviled eggs — see my recipe here. This is a recipe that could earn you a lot of friends. I brought a container of this to work, and it was soon gobbled up by colleagues who asked me not to bring it in again because they didn’t need the temptation. The original recipe came from the Food Network magazine, which always seems to have recipes that just simply work. It was the creation of Marcela Valladolid, who called for the addition of chipotle seasoning, but I leave that out in my version. Here is the recipe, with a few more changes from the original. Heat oven to 250F degrees. Line a rimmed baking sheet with foil and butter the foil. When oven is hot, put popcorn on the pan and scatter the pecans on top. Place in the oven while you do the next step. Place the sugar, butter, and honey in a small saucepan and heat over medium-low, stirring occasionally. When the sugar and butter have melted, increase the heat and boil for 4 minutes, stirring constantly. Remove from heat and quickly stir in salt and baking soda. Remove popcorn from oven and pour the syrup on top, then mix gently with a rubber spatula to coat as much of the popcorn as possible. Bake for 1 hour, stirring with the spatula halfway through to coat more popcorn. Remove from oven, stir once more, and let cool. To remove cooled popcorn from foil, lift it up at each end, gently moving the foil around to ease the popcorn off. This bread would be delicious to have with an Italian meal, for an afternoon snack, or part of a quick lunch. 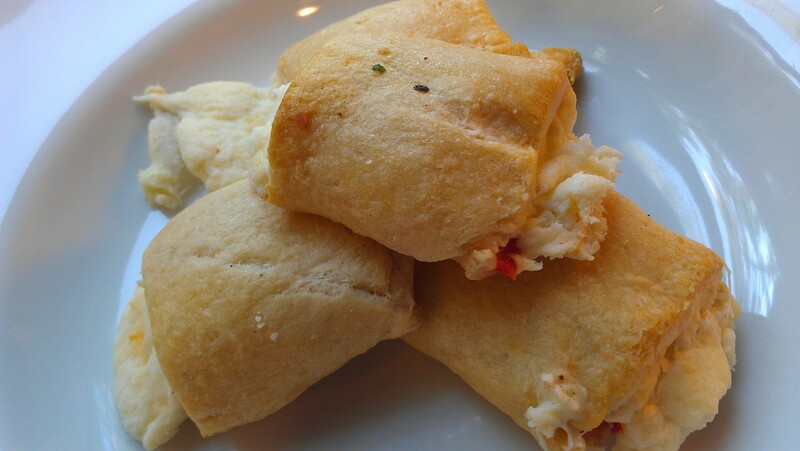 It tastes just like pizza but is made with prepared refrigerated biscuit dough. The fun part is pulling off the individual pieces, especially while it’s still warm. I made this with my son yesterday after seeing the recipe in his children’s magazine. We put the bread on the dinner table and loved tearing the pieces off. There was one piece left over, but it didn’t last very long after dinner. Grease a 1-quart Bundt pan or angel food cake pan with butter or nonstick cooking spray. Heat the oven to 350F/175C degrees. Sprinkle 3 Tbsp. of the cheese and 1 1/2 Tbsp. of the sauce around the bottom of the pan. Separate the biscuits from each other and tear each into three pieces. Place the butter in a small microwave-safe bowl and melt in the microwave. Dip half the biscuits in the melted butter and put them into the pan. Sprinkle the remaining cheese and sauce, bell pepper, and oregano on top. Slightly stretch apart the remaining biscuit pieces, dip into the butter, and add them to the pan. Bake for 20-25 minutes or until browned. Remove from oven and let cook 5 minutes on a rack. Remove from pan and place, inverted, on a serving plate. *For those not in the United States, you’ll have to substitute a homemade biscuit dough for the canned, refrigerated kind. Do a search for “Southern buttermilk biscuit recipe” to find one. I have not made this one, but I love Southern Living magazine, and the recipe is probably good. Complete the recipe through Step 2, then weigh the dough and use only 12 ounces of it. 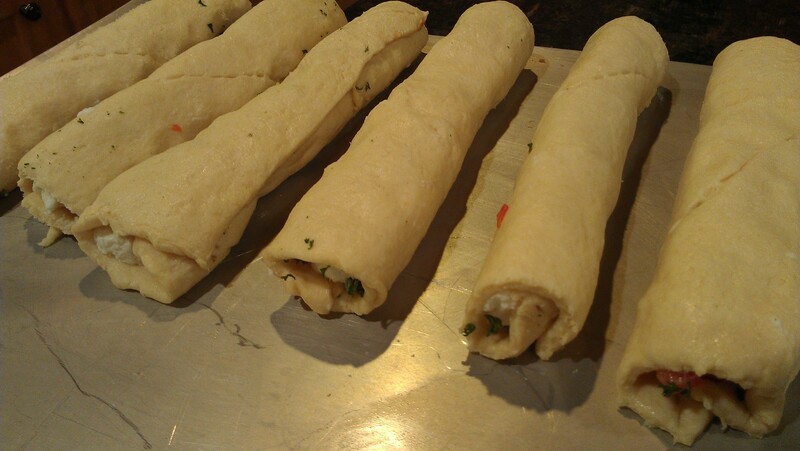 Then divide in half and just pinch off large chunks to proceed with the pizza bread recipe. I made these for an open house we hosted over the weekend. As the only hot appetizer on the table, they went pretty quickly! They are very easy to make, and very easy to prepare ahead and bake when needed. Try as I might, I could not prevent the cheese from melting out the sides to keep these snacks looking pretty and perfect, but it seemed not to matter to the cheese lovers at the party and probably made them more appealing. 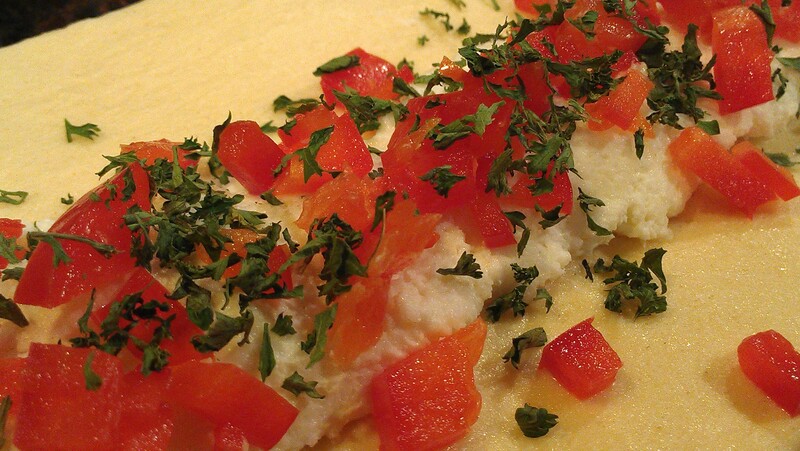 The recipe calls for Pillsbury refrigerated crescent rolls, which I don’t think are available overseas. A quick search online just now turned up this copycat recipe. It seems you can follow steps 1-3 to make the dough, then follow my instructions below to make the rest. Preheat the oven to 350F/175C degrees. Mix cream cheese and 1 cup of the Parmesan cheese until well blended. Spread 3 Tbsp. 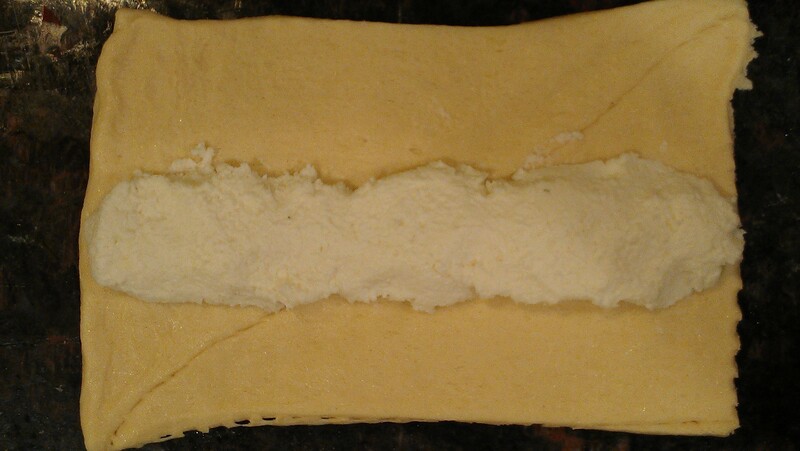 of the cream cheese mixture lengthwise on each rectangle, making sure to go all the way to the edges. Generously top with red pepper and parsley. Fold one long end up over the filling to the center, then fold it up again to close the roll. Cut each log into four pieces, then place seam-side down on a baking sheet. Sprinkle with the remaining Parmesan cheese and bake for 13-15 minutes, or until golden brown. *Note: If making ahead, stop after making the logs. When ready to bake, cut the logs into pieces, then bake. There is no need to bring them to room temperature before baking. Chopping the chicken is the most time-consuming part. For the almonds, I recommend buying them already chopped rather than doing it yourself — though chopping them by hand will give you pieces in different sizes, which looks nice on the end result. Cut each chicken breast into several pieces, then boil for 10 minutes or so, until it is no longer pink in the center. Drain it, then chop the chicken into small dice. In a bowl, combine cream cheese, marmalade, curry powder, salt, and pepper. Mix with a wooden spoon until smooth. 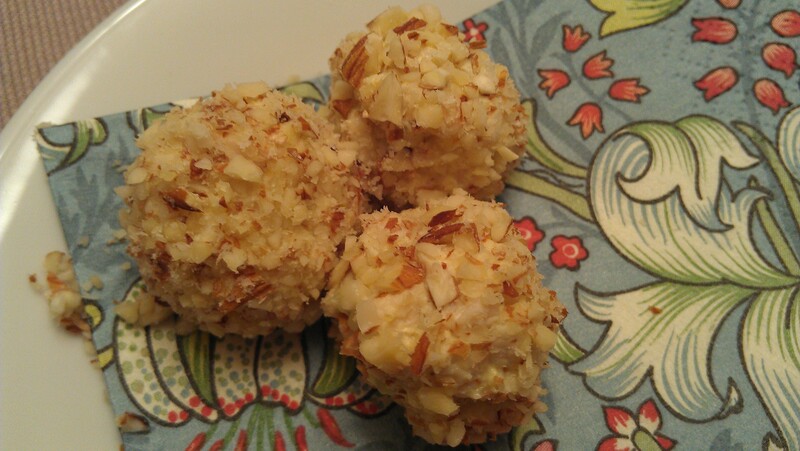 Stir in chicken and celery, then shape into 1-inch balls and roll in almonds.